A recent report from the American Institutes for Research found that fifty percent of students at four year colleges, and seventy five percent at two year colleges, lacked literacy proficiency. Meanwhile, the College Board has determined that an SAT score of 1550 or above “indicates a 65 percent likelihood of achieving a B- average or higher during the first year of college.” To meet this benchmark, students need to score at least a 500 on the verbal section of the SAT. Yet the average American SAT verbal score in 2013 was 497. Collectively, this data speaks to a pervasive problem facing secondary-education teachers and college faculty at institutions around the nation: fully half of all college freshmen arrive unprepared to complete college level work. In my discipline, early American history, the problem can be particularly profound: reading 18th century documents represents a serious challenge for many 21st century students. One text that can be challenging for students is The Federalist–John Jay, James Madison, and Alexander Hamilton’s collection of essays intended to convince the citizens of New York to ratify the Constitution. 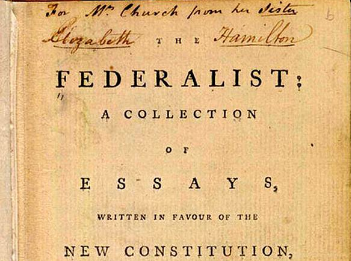 While The Federalist Papers are widely available online, the editions that appear are not annotated with the non-specialist reader in mind; primarily, digital editions are identical to print editions, and offer little guidance to the non-expert reader. This presents secondary education teachers with a profound problem in attempting to make eighteenth century prose accessible to twenty-first century students. Students were given an authentic problem in the field of U.S. History: making the U.S. founding, especially The Federalist, accessible to college and high school students. 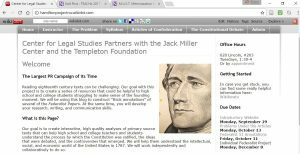 To do this, students worked collaboratively to construct a student-designed website explaining major issues in the founding period, and, constructed a digitally-augmented version of [some] of The Federalist. Students analyzed and discussed primary and secondary source readings on the material. 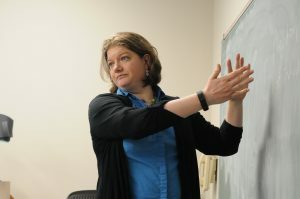 In class lectures targeted key areas of content as well as techniques for library and web-based research. Some in-class time was devoted to coding practice and to brainstorming sessions. Northwestern students decided what site users would need to know to understand the drafting of the Constitution, and developed “augmented” essays in collaboration with one another. 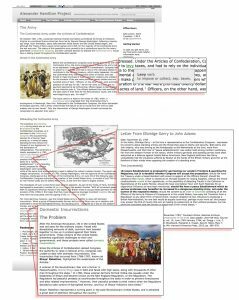 Users can “zoom-in” for specific information on primary sources, individuals, and events, or “zoom-out” to see how this issue relates to other events in the founding period. Northwestern students created a more usable version of The Federalist. They placed the original text side-by-side with a modern day “translation.” Complicated vocabulary is glossed. 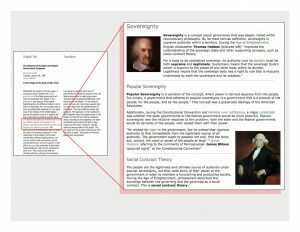 Users can zoom-in to discuss specific concepts, like federalism and the separation of powers, and zoom out to see how the Constitution addresses these issues. I am a postdoctoral fellow in the Center for Legal Studies, where I teach classes on the American founding and the origins of American capitalism. I am a historian and teacher by training: I hold a MAT from the University of Louisville and a PhD in history from the University of Chicago. Currently, I am on leave from my position as an assistant professor of history at the University of Mississippi. You can visit my website here.